Looking for a bargain? Not willing to blow your hard-earned Neopoints or hard-bought Neocash on wearables? Well, you've come to the right place... the Second-Hand Shoppe! It's located deep in the Neopian Plaza, in case you're looking! Dare I spot a bargain? 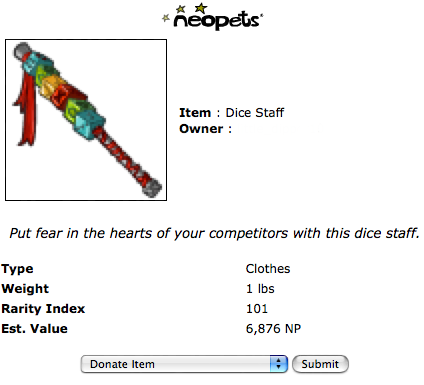 The Shopkeeper accepts any Neopoint item of clothing (Neocash items, of course, cannot be donated). To give something to the Shoppe, choose the 'Donate Item' option under the regular item pop-up in your inventory. Alternatively, you can choose the 'Donate' option in Quick Stock. I'll have you know I'm terribly fashionable! Please note that you can get a maximum of 10 items per day from either the Shoppe, the Rubbish Dump, or the Money Tree; mix and match as you wish, but you can't double-dip! You'll notice the occasional non-dung item donated by people called 'Hubrid' and 'Lucie', among others. They donate wearable items with rarity range r40-r70. These are items fed into the shop by TNT on behalf of Neopia's most famed characters... basically to break up the dung monopoly. You can see the full list of our generous donors below. That's about all there is to say. Happy sniping!